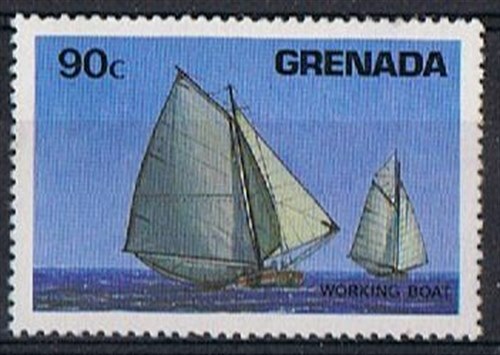 Grenada issued in 1984 four stamps which shows some ship calling or used on the island, the 90c shows us a sailing working sloop. The Windward sloop of the Caribbean Islands began in the 18th century when Scottish settlers arrived on the islands, they brought the boat building to the islands. They hand-built the wooden vessels. The sloop of the Windward and Leeward Islands is widely used to carry freight, passengers and sometimes for fishing. Most are rigged with a gaff jib-headed or gunter mainsail, and 1 or 2 headsails; has an exceptionally long boom. Most roughly built with carved planking usually of pitch pine above the water, greenheart below, ribs made from natural crook frames of white cedar. Counter or raked transom stern, curved or straight raked stem; bluff bow. ; full body amidships; strong sheer. The largest sloops were decked, often with a trunk cabin in after part. Northern boats that engaged in fishing may have a wet well, but in the southern islands, the fish are dried in the rigging. Those with auxiliary engine have a double sternpost, the rudder hung from the after post. Crew of 3 plus a boy. Reported lengths 7-30m: e.g. length 8,2m, beam 2.4m, depth 1.2m. Nowadays the remaining sloops are primarily tourist attractions and used in regattas across the islands. Grenada 1984 90c sg 1344, scott?